Marilyn Ball, Albatross, 2018 (detail) by Linde Ivimey. Photo: Supplied. As part of its twentieth birthday celebrations, The National Portrait Gallery (NPG) is hosting its Winter exhibition, ‘So Fine: Contemporary women artists make Australian History’ from June 29th until October 1st. The exhibition will feature the works of a diverse group of ten women artists. The artists work with painting, ceramics, woven tapestry, photography and sculpture using an array of materials and processes. In addition to the NPG birthday events, some of the So Fine artists will participate in a forum panel discussion on biography and creativity called ‘Writing lives, revealing lives: portraiture and personhood.’ The forum is in partnership with the Australian National University and will run from June 30th until July 1st. Canberra-based artist, Valerie Kirk, will be an exhibitor and one of the forum panellists. Valerie is a Scottish-Australian tapestry weaver who discovered her passion for woven tapestry as a student at Edinburgh College of Art. Valerie says tapestries take time to weave but the process gives her the opportunity to come into a space where she feels completely connected to the work – “a connection to an inner world of thinking, processing and making – a space beyond logic that summons the senses and all that I know”. For Valerie, tapestry combines her love of art with textiles. 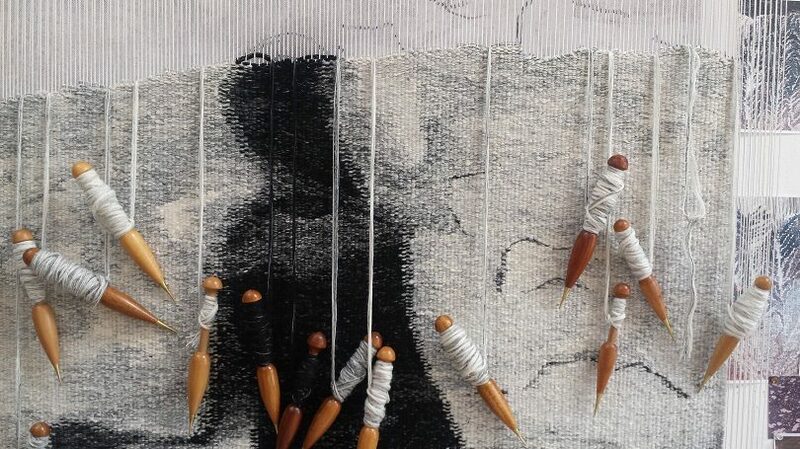 Her artwork in the So Fine exhibition reflects on what is lost and gained in emigration through intricate woollen tapestries and painted slates, exhibited with precious antique pieces of Ayrshire white embroidery. Valerie’s work in the exhibition puts a spotlight on her own experience of migration from Scotland to Australia. Although Australia is now her home, she constantly oscillates between the two countries, psychologically and physically. The Traveller. Tapestry by Valery Kirk. Photo: Supplied. The Traveller is one of Valerie’s exhibition pieces inspired by a textile tour she led in Peru. Valerie noticed her shadow as a light, unfixed, impression over rocks at an archaeological site near Ayacucho. Her shadow looked as though it was holding a large walking stick and that was the moment Valerie recognised herself as a traveller exploring the world and not deeply rooted in a particular place. She took a photo and adapted and re-drew it for the tapestry design. It took six weeks to weave the masterpiece. 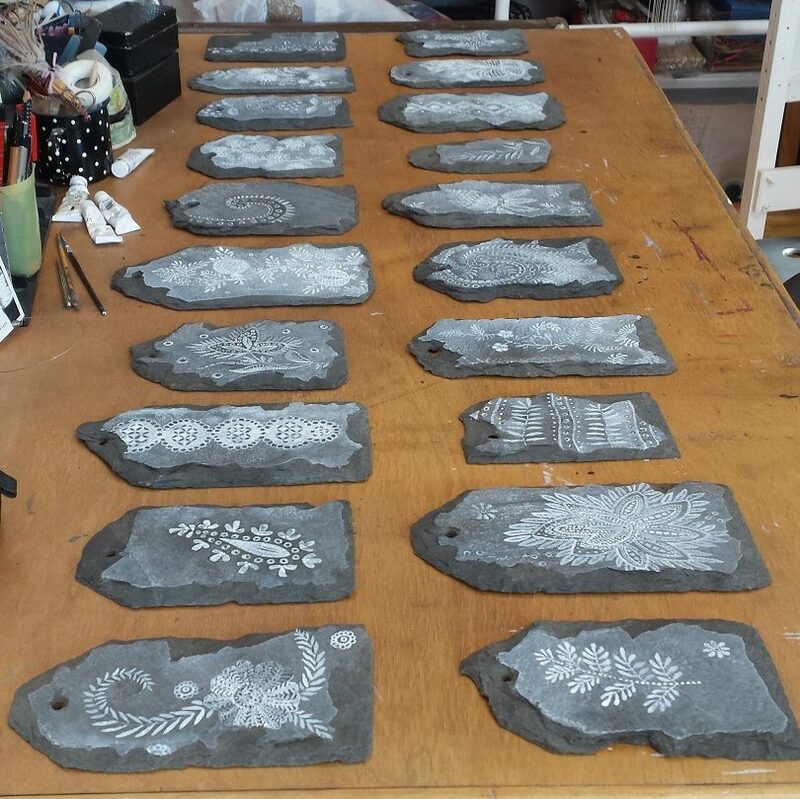 Ayrshire Slates by Valerie Kirk. Photo: Supplied. Ayrshire Slates is a body of work inspired by Valerie’s studies of a family collection of heirloom textiles in Scotland, where she also coincidentally salvaged little ‘peggies’ (small roofing slates) from a derelict building and brought them back to Australia. This series was created by mixing gouache with water painted on the surface of the slates to evoke the white muslin or cotton lawn fabrics used in Ayrshire needlework. The work developed as a reflection on the textile tradition, heritage and culture, and they also remind her of the weather, seasons and natural environment of Scotland. Tickets are $10 for adults and $8 concession. Children under 18 are free. Find more information here. I love and respect the Portrait Gallery – but what on earth does this show have to do with portraiture? Diversity and inclusion at work?